Jump to RecipePho is an a ubiquitous Vietnamese soup that consists of noodles, meat and some veggies and herbs in a rich, aromatic broth. 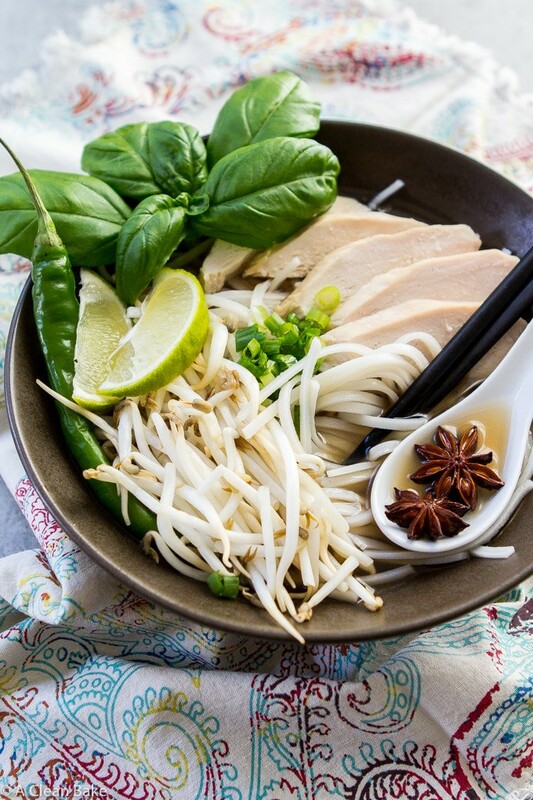 My 30 minute gluten free pho is a low-maintenance version that is easy to make at home! I know what you’re thinking: soup in July? Well, the combination of unseasonably cool weather and brutal summer colds a couple of weeks ago pretty much made it seem like the only option was soup. Everyone has their stuffy nose/flannel pants comfort food, and mine is pho. 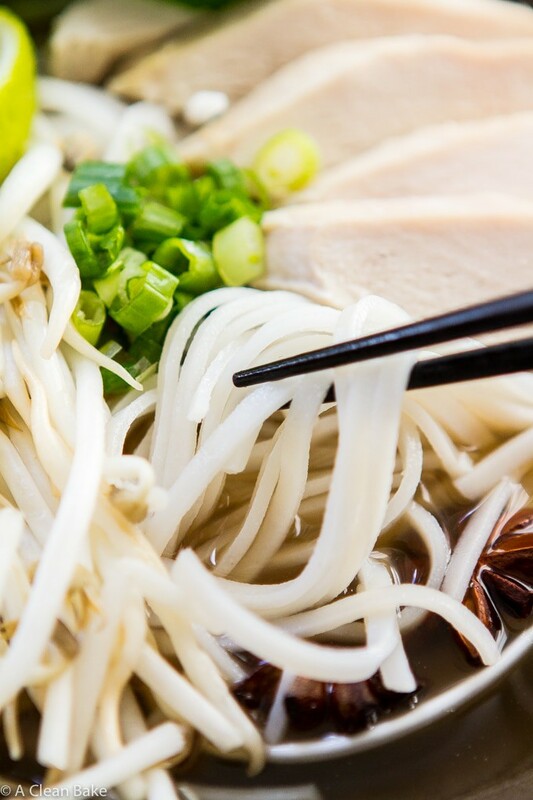 I love pho (pronounced like an amalgam of the sounds “fuh” and “fur”; just make one of those two sounds while simultaneously relaxing your mouth and holding it really, really still), the vibrant Vietnamese meat-and-noodles soup that is the talk of the town. Well, that is until poke bowls started to elbow in on pho’s trendy territory. What the pho is pho? 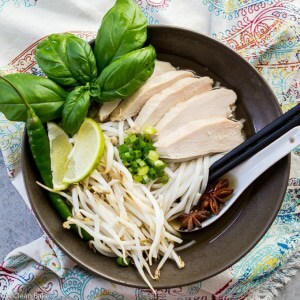 If this dish is unfamiliar to you, picture a rich, impossibly complex, silky smooth aromatic broth packed with warm, soft noodles and tender meat, then topped with crisp fresh bean sprouts and green onions, bright lime wedges and a mountain of bright Thai basil. Sounds borderline insane, right? It is. Pho is a Vietnamese noodle soup that consists of broth, noodles, meat (usually chicken or beef) and fresh toppings including basil, bean sprouts, green onions, and – sometimes – some kind of hot pepper. The preparation of the broth, the heart and soul of the dish, without which the dish is just a bowl of limp noodles and some mismatched green accouterments, is the truly insane part. Here’s how you make pho broth: procure some beef bones. Roast the bones for 400 hours. Then simmer them for about 3 millennia with some spices. 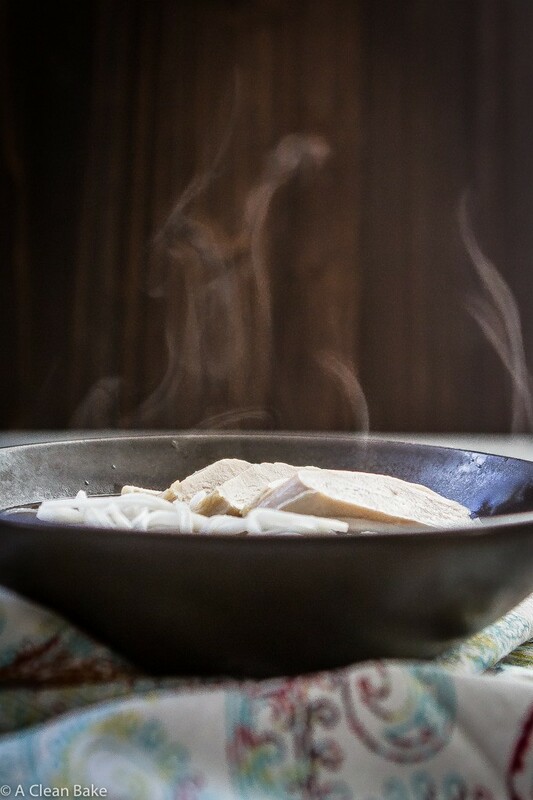 The long, slow simmer releases all of the good stuff from the bones, resulting in the silkiness of the broth. And the prolonged mingling with spices that – by all rational calculations, should not be in soup, let alone combine so harmoniously – produces a flavor that is out of this world. Ok, those cooking times might have been slightly exaggerated. But you get the idea. 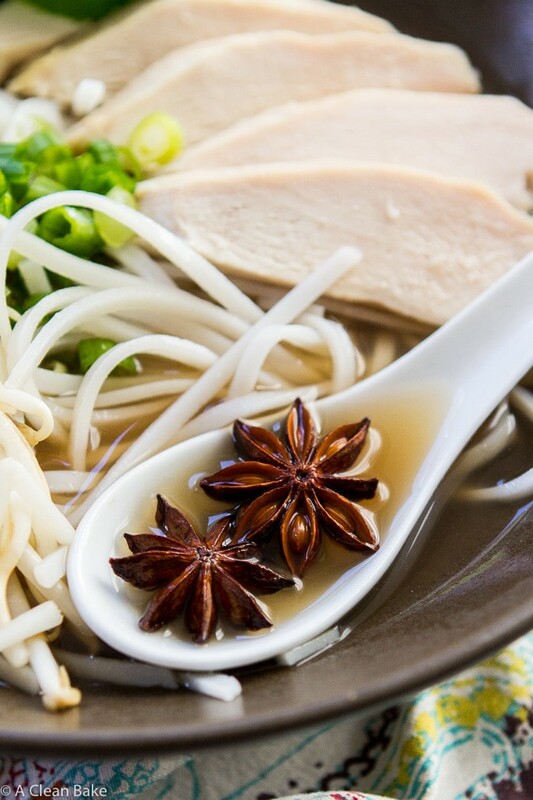 If it’s made right, yes, pho is gluten free. Traditionally, pho is made with rice noodles and nothing in the soup should be fried or otherwise at very high risk for cross contamination. But check the menu at your local Vietnamese restaurant before you order. 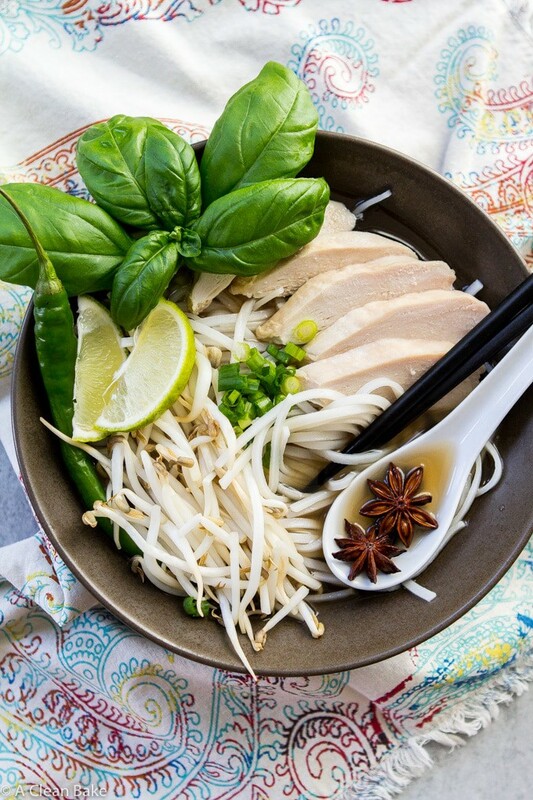 Be on the lookout for a gluten free section of the menu, or a separate menu item labeled “gluten free pho”, which could imply that other pho options on the menu aren’t safe from gluten ingredients (like soy sauce, fish sauce, or hoisin sauce) or cross contamination. Keep in mind, also, that many Vietnamese food features many fried ingredients and dishes. This may not apply to pho, but you can never be to sure – so ask to be sure they don’t add a surprised fried garnish or anything. If you have celiac disease or are otherwise very sensitive, don’t forget to request that the restaurant fry anything you order in a dedicated fryer. In addition to being gluten free pho is a great Vietnamese food option for diners who are dairy free and have other food allergies as well! So, how do I make it in 30 minutes? There is one, and only one, shortcut that I have been able to figure out that makes this dish, well, possible to make at home for a normal person with a job or a kid or really any other non-pho priorities: bone broth. Packaged bone broth, specifically. Remember from this post that bone broth is the long-simmered version of your typical chicken stock, with an exponentially longer cooking time and an equally more complex flavor and texture profile. 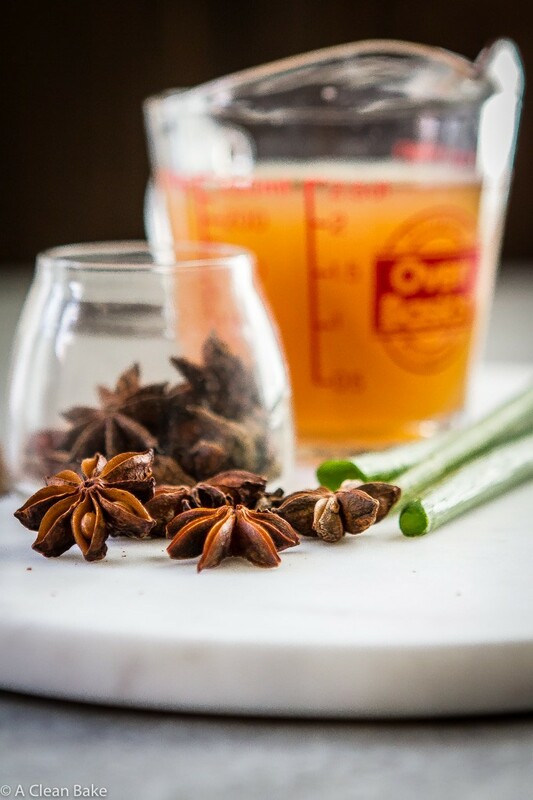 Pho broth is essentially bone broth, and these days, really good quality bone broth is available in stores and online – making your homemade pho about 80% done as soon as you open the carton. And that’s how you get from 3- millennia pho to 30 minute pho. My go-to bone broth lately has been Kettle & Fire ‘s 100% grass fed, organic broth, because you can find it either at Whole Foods (or other retailers), or online (via their website or Amazon) and because it is the real deal. Remember how we (briefly) discussed the difference between stock and broth? TL;DR: stock is great for flavor and reducing waste by making the most of your chicken carcass. But broth, the longer, more slowly simmered version, is the real nutrition powerhouse. It is packed with amino acids that help your body rebuild tissue and heal. Amino acids were – and continue to be – an absolutely essential component of my gut-healing protocol (if you’re new here, I had/have severe leaky gut, which was/is one of the causes of all my food intolerances, and which I am still working to heal), so I try to get it everywhere I can. The amino acids in bone broth also improve the health of your joints and skin, resulting in benefits like reduced joint pain in people suffering from arthritis, helping the body heal wounds more quickly, and – as I said- helping to heal and seal the intestinal wall. It’s important to point out (because this was news to me when I started my healing protocol) that many people – even ones eating healthy diets, full of vegetables and high quality meats – don’t get enough amino acids in their diets. So that’s the why. Let’s talk about the how. As I said, making traditional pho is a long and tedious process because the broth is so high maintenance. But since we are using high quality, great flavor, pre-made broth, so much of the work, and the flavor, is already done for you. The rest of the process involves simmering the broth with some spices to round out the rest of the traditional pho broth flavor, then pouring the broth over cooked chicken and noodles (to make this low carb and Whole30, use zucchini, sweet potato, or parsnip noodles in place of rice noodles), and topping the whole thing with a variety of fresh, crisp herbs and vegetables, and a spicy drizzle of chili paste. Soup in summer? Don’t knock it ’til you try it! 30 Minute Pho is a homemade version of your favorite Vietnamese soup that is easy to make at home! No need to spend hours in the kitchen. Make it tonight! Put all of the broth ingredients in a saucepan. Cover and bring to a boil, then uncover and reduce the heat. Simmer 30 minutes. While the broth is cooking, prepare the noodles. Place the dry noodles in a large mixing bowl and add enough boiling water to cover. Let sit for 5-10 minutes, until softened to your preference. Divide the noodles between 4 bowls. 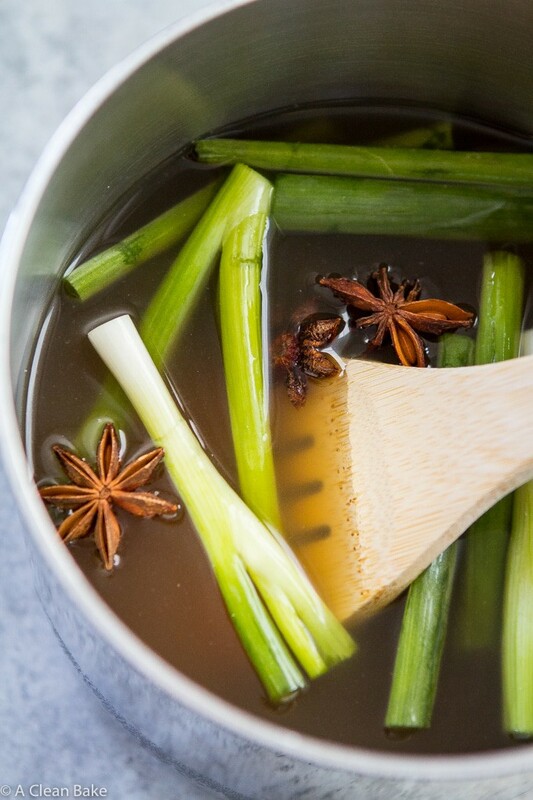 When the broth is finished cooking, remove the ginger, scallions, and star anise pieces. Divide the broth between the bowls, pouring directly over the noodles and chicken. If you have a few extra minutes to simmer, the flavor will benefit from another 10-15 minutes. If your broth gets too concentrated, add water, 1/4 cup at a time, until you are satisfied with the concentration. You can make the noodles and broth ahead of time and reheat them both in the microwave or on the stovetop (place the noodles in boiling water just until softened. It won't take more than a minute or so; just warm up the broth in a pot). For added efficiency, use rotisserie chicken, or make it ahead of time and slice it just before assembling. To make this low carb and Whole30, use zucchini, sweet potato, or parsnip noodles in place of rice noodles. Thank you to Kettle + Fire for providing the ingredients that inspired this delicious recipe. This post contains affiliate links, which means that if you click through and purchase a product, A Clean Bake receives a small commission. All proceeds go toward continuing to bring you delicious, healthy recipes every week, and this does not affect the price you pay. Thanks for supporting A Clean Bake!